Canadian hard rockers Famous Underground — the new project of former Slik Toxik frontman Nick Walsh together with his long-time bassist/musical partner Laurie-Anne Green — recently inked a worldwide two album deal with German label Dust On The Tracks Records. The group’s self-titled debut album, which is slated for reissue on June 7th, will be released through Sony (Europe), MVD (USA), RSK (UK) and Universal (Canada). The CD will come in a digi including an eight page booklet. 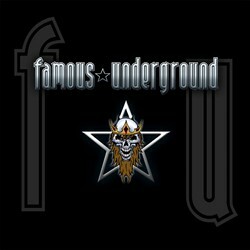 Famous Underground’s self-titled studio release was produced by Nick Walsh and mixed by Darius Szczepaniak (The Black Crowes, Sacrifice) at Rouge Valley Studio in Toronto. The new recording takes Walsh’s writing to a more defined state where the lyrics delve more into the complexities of the real world. These musicians have independently garnered critical acclaim supporting such acts as Motley Crue, Def Leppard, Kid Rock, Black Sabbath, Billy Talent, Yngwie Malmsteen, April Wine and many other international acts. More information about Famous Underground can be found at www.famousunderground.tv and www.facebook.com/famousunderground.